The Ministry of Information & Broadcasting has been awarded the Platinum icon award for the Comprehensive Web presence in the Web Ratna Awards 2014. The award today was conferred by the Minister for Communications & Information Technology in the presence of Secretary, M/o C&IT, Shri R.S. Sharma. The award was received by Ms. R. Jaya, Joint Secretary on behalf of Secretary (I&B), Shri Bimal Julka along with the New Media Wing team of the Ministry. The award was presented to Ministry of Information & Broadcasting for having a significant presence on all social media sites which makes it accessible for users through multiple online platforms. The website follows GIGW guidelines. It caters to the information needs of various stakeholders by providing access to all the policies and guidelines issued by the Ministry. The home page of MIB website has timestamp, giving last update details. The website has a dedicated Hindi version besides regular English version. The portal has a Google enabled search facility to search within the HTML content. The website is based on Content Management System (CMS). 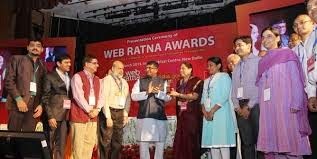 Web Ratna Awards have been instituted by the Ministry of Communications and Information Technology, acknowledges unique initiatives/practices of various states/UTs in the realm of e-governance. The Government of India has been bracing for innovation and transformation in delivery of information/services with adoption of best ICT practices. Web Ratna Awards recognize these e-governance initiatives. Web Ratna Awards were instituted to appreciate and acknowledge the initiatives and contributions of individuals & institutions and their innovations, which have empowered the Government in achieving the vision of good governance. Web Ratna Awards was instituted in the year 2009. Mandatory emigration clearance will be required from POE for Indian Nurses seeking overseas employment in 18 countries w.e.f 30th April 2015. The Ministry of Overseas Indian Affairs examined the issue of exploitation of Indian Nurses going abroad for employment and it has been decided that with effect from 30th April, 2015 Indian nurses will mandatorily obtain emigration clearance from the office of Protector of Emigrants (POE) for seeking overseas employment to United Arab Emirates (UAE), Kingdom of Saudi Arabia (KSA), Qatar, Oman, Kuwait, Bahrain, Malaysia, Libya, Jordan, Yemen, North Sudan, South Sudan, Afghanistan, Indonesia, Syria, Lebanon, Thailand and Iraq . Indian Nurses going abroad for employment in the above mentioned countries must obtain emigration clearance from the POE offices with effect from 30.04.2015. 2. It has been decided that recruitment of nurses for Overseas Employment will initially be restricted through two state run recruiting agencies viz. NORKA Roots and Overseas Development and Employment Promotion Consultant (ODEPC), Kerala only. All the registered Recruiting Agents are informed for not recruiting any nurse for overseas employment for the above mentioned countries with effect from 30.04.2015. 3. Recruitment of Indian nurses for overseas employment in these countries, through any other Indian recruiting agents would be permitted whenever such a proposal is received from these countries subject to the condition that the Ministry of Overseas Indian Affairs has issued such a country specific order. 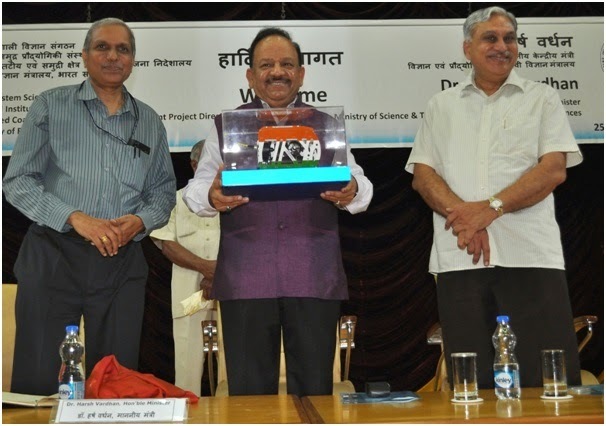 Union Minister for Earth Sciences and Science & Technology Dr Harsh Vardhan today dedicated to the nation an indigenously developed remote-controlled Polar vehicle which would reach where no human can dare to go. It will be deployed in the extremely harsh Polar Regions and will be remotely operated by our scientists at our base in Antarctica. The Minister said that the results of its findings will contribute vastly to mankind’s understanding of climate besides enhancing our capability to predict the Monsoon”. He was speaking after a visit to the National Institute of Ocean Technology (NIOT), a part of the Earth System Sciences Organization (ESSO) in Chennai this evening. Its successful development by ESSO-NIOT signals the beginning of a process of both self-sufficiency and entry into the highly sophisticated field of Remotely Operated Vehicle (ROV) engineering which has hitherto been dominated by the western powers. Dr Harsh Vardhan said. “We have taken the polar plunge. PROVe and its subsequent versions will enable us to understand the Polar influence on ocean currents affecting the movement of Monsoon winds on which much of our economy depends”, he added. After years of work based in Dakshin Gangotri (Antarctica), Indian scientists have discerned a clear connection between the thermohaline circulation that originates in the North Atlantic and southern Arctic and the Monsoon. It is a major force that drives not only the oceanic circulation but also regulates the global climate. He added that PROVe’s systems have been integrated with Conductivity, Temperature, Dissolved Oxygen sensors and Irradiance meter. PROVe was later deployed near ice shelf from the ship at the India Bay in Antarctica at a depth of 62 metres. Further explorations and data analysis are in progress. The country, he said, is on track with the objective of developing reliable technology to solve the varied technology problems associated with harvesting living and non-living resources in the Indian Exclusive Economic Zone which makes up about two-thirds of the land area of India. ESSO-NIOT has forged collaborative agreements with leading world institutions like JAMSTEC, Japan, and Woods Hole Oceanographic Institute (WHOI), USA. Under the Ministry`s Monsoon Mission program, ESSO-NIOT is part of an Indo-US initiative involving the participation of several institutions. This group is studying the science behind the monsoonal events of Bay of Bengal using both Indian and US research ships using special equipment. The results are very promising from the point of view of enhancing insights into air-sea interactions. Dr Harsh Vardhan interacted with scientists and technicians of ESSO-NIOT and was briefed on the progress of research on coastal zone management. He urged them to keep in mind environmental concerns. Memorandum of Understanding (MoU) was signed between the Indian Army and ICICI Bank on the Defence Salary Package today. The signing ceremony was chaired by the Adjutant General, Lt Gen Rakesh Sharma and was attended by top dignitaries of ICICI Bank headed by Mr Maninder Juneja, Senior General Manager. The first MoU between ICICI Bank and the Indian Army was signed in 2011 and was valid for a period of three years. The revised MoU is tailor made to suit the requirements of serving soldiers, pensioners and families. Number of additional facilities have been incorporated in the revised MoU after concerted efforts. Army is confident that this MoU will benefit a large number of serving and retired Army personnel who are having their accounts with ICICI Bank and also provide them an opportunity to access modern banking facilities. The basic features of the MoU are the same as before. Some features which have been improved from before are enhancement of Personal Accident Insurance (PAI) cover, enhancement of Air Accident Insurance cover, insurance cover on house loan and enhancement of purchase protection. A Dornier aircraft of the Indian Navy on a routine night training sortie ditched at sea about 20 nautical miles South West of Goa on the night of 24 Mar 15. The Naval Air Station at Goa lost radar contact with the aircraft at 10:08 PM on 24 Mar 15. The aircraft is feared to have ditched soon thereafter. The aircrew onboard the aircraft comprised three officers (two Pilots and one woman Observer). One Survivor, Commander Nikhil Kuldip Joshi, was picked up by a passing fishing boat (Niharika – from a fishing hamlet off Karwar) and transferred to a naval Fast Interceptor Craft. He is presently in naval hospital ‘Patanjali’ at Karwar and is reported to be stable. Eight Naval ships and four aircraft were immediately deployed to search the area to locate the remaining two officers. Presently, there are 12 ships (including two ships from Indian Coast Guard) and four aircraft involved in the SAR operations. The Next of Kin of the aircrew have been informed. Meanwhile, a Board of Inquiry has been ordered to establish the cause of the accident. During the day Admiral RK Dhowan, Chief of the Naval Staff, flew down to Goa and took stock of the SAR operation. He also met the families of the aircrew and met Cdr NK Joshi at Karwar before returning to Delhi in the evening.